Updated: Luchi Cruz-Valdes to step down as News5 chief? 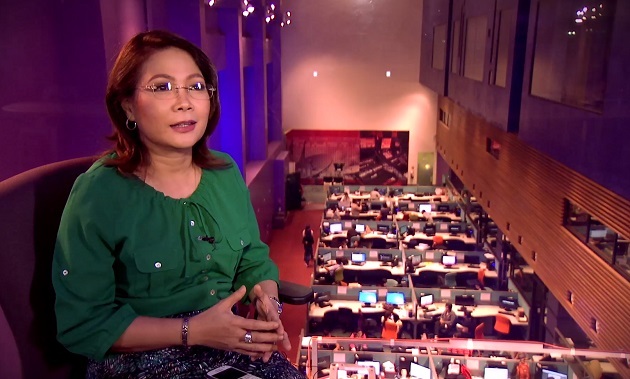 Sources connected with Cruz-Valdes tell us that the veteran journalist has decided to stay with the Kapatid Network — continuing her role as news chief of its news division and as anchor of Aksyon Prime and Reaksyon. Luchi Cruz-Valdes, who has been TV5's news chief since 2010, is likely to vacate her post this month, sources tell Media Newser Philippines. The head of News5, who is also the co-anchor of Aksyon and host of Reaksyon, is said to be mulling a resignation after being offered a chance to become tourism attaché for the Department of Tourism. "She went to the U.S. last month and from the looks of it, LCV wants a fresh start," says a source who spoke to us on condition of anonymity. According to another source, an announcement could be made as early as next week regarding the future of the veteran journalist and the Kapatid news division. This source adds, "Nothing is definite yet but they are ready. The management team is ready and they are putting in place people who could assume Luchi's post, as well as DJ's." Changes at TV5 have been swift and sweeping in recent months. Already, the network lost two of its top news talents, Martin Andanar and Cherie Mercado, as well as its news operations head DJ Sta. Ana. And just recently, Noel Lorenzana resigned from his post as CEO of Mediaquest Holdings, the parent company of TV5, CignalTV, BusinessWorld, and Bloomberg TV Philippines. We have reached out to Ms. Cruz-Valdes and TV5 for a statement regarding this matter and we'll update this post once we hear from them.